Our Funarena! : The Maggi Muddle! 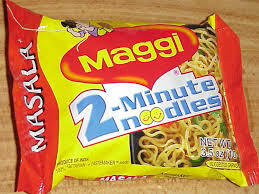 Repeated food safety tests across India confirmed the presence of poisonous lead and a chemical monosodium glutamate, widely known as MSG in the famous 2-minute Maggi noodles. First the capital Delhi banned the noodles for 15 days and then state after state of the country started following suit. On Friday, the 5th of June, 2015 Food Safety and Standards Authority of India (FSSAI) ordered Nestle, the company producing Maggi, to recall all nine variants of the noodles from the Indian market. After that branches of FSSAI got into action in states like Maharashtra, Meghalaya and others too where the ban was not yet announced pending test reports or non-conclusive results. Even after all these serious developments Nestle refuses to admit that their noodles are not really fit for consumption, particularly for the innocent children who were too fond of it, or that at least some serious problems could be present. Obsessed perhaps with the need for damage control to prevent huge losses the company attributes the findings as 'confusion' and says that the noddles will return to the shelves very soon. They are trying to prove that all the tests done across India are wrong and that testing standards in the country are very poor. Nestle must understand that the 'confusion' is in fact created by them only and not that the 'confusion' has damaged their products. They are trying to mislead the consumers. In most parts of the country consumers do not have proper awareness about food safety and related issues, and they do not want to give up their food habits easily. The noodles have been in their homes for around thirty years making them almost accustomed to provide 2-minute meals to their children. Now with the company's so-called assurances that could have been passed on by the dealers spread across the country most ot them who are not very media-savvy are finding it difficult to decide. Confusing reactions are being heard all over. Most people would want to know why nothing was found wrong in the past thirty years and why now only. Well, they must understand that a wrong remains a wrong irrespective of when it is finally detected and they should appreciate the fact that it is found out before serious health problems could actually occur. Some others are stoic or indifferent, 'how does it matter, if you like eat it, if you do not want don't eat! Who has died eating Maggi?'. Or 'As long as I find it in the stores I'll continue eating it!' Some other reactions border on the ridiculous and absurd. 'You see, this whole thing is being orchestrated by a political party who could not get enough funds from Nestle in the last elections!' Well, in India everything gets politicized. But you also need to know that eating is not normally a political issue and that states of all political hues and colors across India are in fact banning the noodles. In the recent years most of the popular fast foods are being categorized as junk food which are harmful for health due to the numerous dubious ingredients found there. But no serious efforts have been made by any government to create awareness about fast food or junk food. Food safety is a must. Now is the time for starting campaigns similar to 'no tobacco' ones in relation to all packaged and junk food that are harmful or could be harmful. 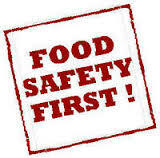 The FSSAI too must go hammer and tongs to improve its stadards and ensure food safety for all citizens of the country.